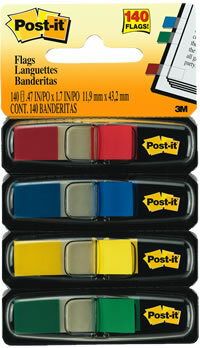 Among office supplies frequently used range from the everyday pen and paper to more specialized tools like the Post-It Flag. These flags are thin strips of adhesives used to denote special pages. Accountants depend on post-it flags and will easily go through decks upon decks of flags to remind themselves that there is still lots of work to be done. Post-it flags run the gamut of colors and are beloved by accountants for their ability to blanket binders of workpapers so that they more closely resembles the NBC peacock than books of financial record. Flags are different from regular post-its in that their use is much more limited to – as their name implies – flagging pages of interest rather than writing out notes. As with everything an accountant does, a hierarchy or system of post-it flag colors needs to be established. This is important once again because it allows accountants to have a false sense of choice and being able to make a difference. Not only the color, but the position of the flag is also crucial. Accountants cannot be expected to get work done with post-it flags placed on the wrong corner. Finally I feel understood!!! I LOVE post-it-flags. And of course I have to have a system, what pink, blue, green, etc mean. This website is the best thing ever!!!! !